I have been fortunate to have visited Rome several times and even stayed there for one month once. I have always noticed that there seem to be a lot of cats around. This especially seems to be true around any of the ancient ruins, notably the Colliseum and the Roman Forum. 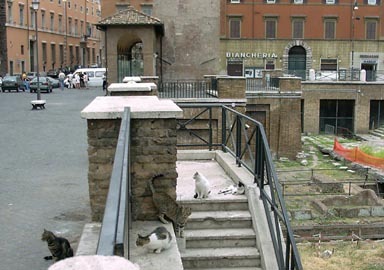 It also turns out that there is an official cat sanctuary at Torre Argentina which is another excavation near the center of Rome. They turn up in all kinds of places and can make very cute photos. Supposedly these cats have their origin in cats brought from Egypt 3000 years ago. I have seen cats everywhere. Indeed there are estimated to be at least 300,000 feral cats in Rome so it’s not particularly surprising that they’d be highly visible. While they are not universally appreciated there a lot of “Gattare”, that is, cat ladies who make it their mission to feed cats. While it is a feminine noun I have also seen men leaving food out for their neighborhood feral cats. While to some these gattare may have all of the appeal of those that feed pigeons here, i.e. not particularly viewed as benign, they soldier on. They have in fact in many cases organized into gattara associations. The best of them not only care for the cats but also recognize that uncontrolled breading of feral cats it quite a problem. 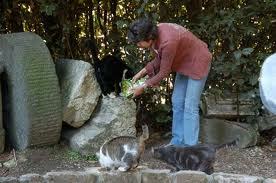 At the Torre Argentina cat sanctuary they regularly spay and neuter cats to help control the cat population. The cats are not only tolerated by the authorities but actually are legally protected. It was interesting researching this subject because there is an amazing amount of information about the cats and the gattare – who knew? There is even a movie made in 2007 call, what else, “The Cats of Rome”. I am only vaguely familiar with the childrens books about a little Parisian girl named Madeline but there is one entitled “Madeline and the Cats of Rome”. 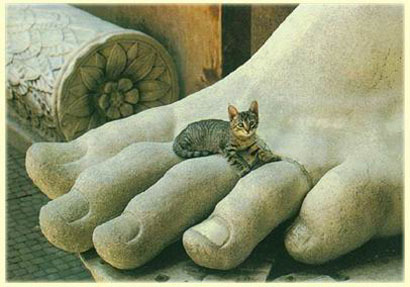 So that cats of Rome are both legendary and very current. 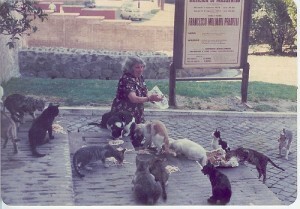 Last but not least there is the website for the cat sanctuary at Torre Agentina and you can go there by clicking here. This entry was posted on Monday, October 25th, 2010 at 10:03 am	and is filed under Culture, Travel. You can follow any responses to this entry through the RSS 2.0 feed. You can leave a response, or trackback from your own site. And if you can, consider making a small donation. I became familiar with Torre Argentina on my first short visit to Roma. 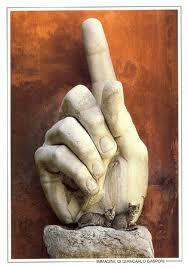 It is a wonderful organization that truly cares about the welfare of the cats. If you feel so inclined ask them about adoption. They support “adoption at a distance”, though I have to admit we probably have plenty of wonderful cat’s to adopt here as well. Thanks for writing about this Joe. You are welcome and thank you for your comment. It really is a fascinating thing that cats are so common in Rome and, I think, in other cities as well. I certainly have seen them and seen people feeding them occasionally. I can’t think of any equivalent here. It’s really not a good thing for the cats. Between the exposure and the fleas it surely is not a great existence even if they are fed regularly. No it really isn’t good. Many of Roma’s feral cat’s don’t live to be very old for a variety of reason: disease, other animals, unfortunate accidents with vehicles, and the like. This organization is doing it’s very best to help them. I am currently in Madrid. I spent the afternoon in Parque de el Retiro. One of the highlights of this trip was watching an older gentleman feed the feral cats that live in the park. He was opening several cans of cat food to the delight of about 12 or 13 noisy cats, most of them younger cats probably born this year. He tried to pet them, but they wouldn’t let him near enough. Thinking about your post I knew I would have to send another comment.